In my last letter to you I left a form of question hanging in the air, about how young women were able to open their own photographic studios in Germany when craft trades, and most businesses, were only open to men. It is something that I have been thinking about for a while, but which seems to have no clear answer. I suspect, although I cannot prove, that many believed photography to be a hobby more than a business, despite the number of studios which opened from about 1870 onwards, and the massive interest which surrounded this art form. Initially there were no schools, those who wished to learn had to either teach themselves, or latch on to someone else who know the business and was prepared to show them. This was not as easy as it may seem, since the first photographers did not have set studios, had no shops where they could be found day and night. The first few who brought this art to Germany came from France, and travelled from one city to another plying their trade. They had mobile studios which could be set up almost anywhere, and needed only running water and peace and quiet to work in the darkness of their tents. And, of course, enough people who were interested in having their portrait taken at great expense. They were, of course, men. You also have to remember that many of the true arts – painting, sculpture and so on, right down to literature – were still considered the exclusive arena for men. Any woman who undertook to learn how to paint or to sculpt was accepted, indulged, but not taken seriously. Women learned art as a hobby; it was expected of them. Part of the initial training for a woman in preparation for her life as a housewife and mother was household management, embroidery and watercolour painting. Many of the famous authoresses we know of today had to publish their works privately – that is, they paid for the works to be published at a time when other works by men were paid for by the publisher – or they had to write under a name which was clearly, or appeared to be, male. Women were indulged in art schools, taught formally how to follow a simple school of art, but never with the intention that they should exhibit their works, or even sell them to the general public. It’s hard to imagine today, with all the advances of the last fifty and more years, but right through to the end of the Second World War a woman’s place was considered to be in the home, and that did not include any form of artistic endeavour. Last week I watched a film about the German artist Paula Modersohn-Becker where this was all made very clear indeed. She joined an artist’s colony in Germany in the village of Worpswede, a very famous area in the north regions near Bremen. Initially it was with her father’s permission and with the understanding that she would attend a summer course in painting, then return to Bremen, marry and support her new husband, whoever that might be. While she was at Worpswede it was made clear to her that her artistic style did not meet the expectations laid out for women: it was far too free; there were too many bright and / or earthy colours; it was not realistic enough; the people portrayed were not immediately recognisable for who they were – people, yes, but it was difficult to put a name to them. It was made clear to her that she had to follow a certain form of art, and a certain form of life as a woman. She did indeed marry, another artist and not a man of her father’s choice, and they lived on in Worpswede for a further five years together but, even so, everything encompassed what her husband did as an artist – he was a famous landscape painter – and not what she did. Her work, and that of the other women in the colony, was irrelevant. So she did what any sensible person would do: she left. Some would give up and let themselves be oppressed, pushed down to a lower level of subservience, she didn’t. She found herself a small apartment with plenty of light in the much freer society in Paris, and worked at her art. During this time she attended a famous academy, had a lover or two – still married – and painted all that she saw, from living models through to dead bodies. She was supported, financially, by her husband. 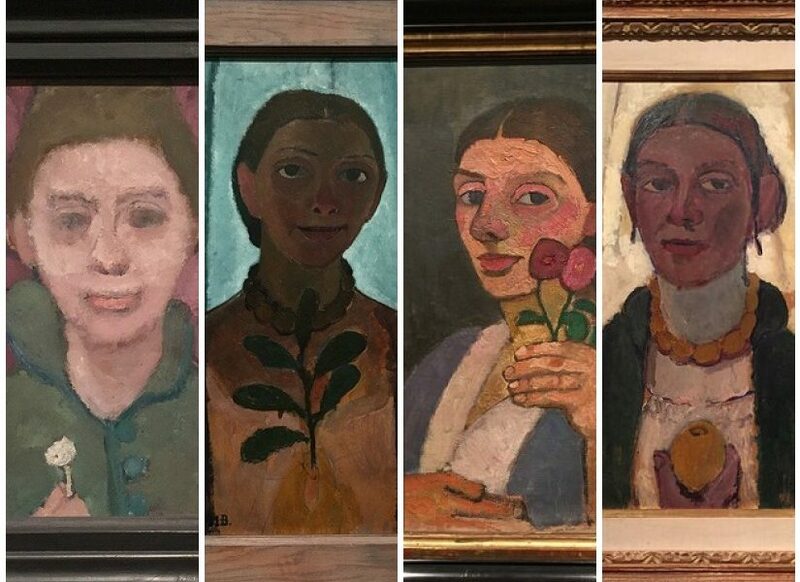 Eventually Paula Modersohn-Becker returned to the colony in Worpswede, and her husband, but she continued to paint even though there was no commercial prospect of success. She had her first child and then, shortly after the birth and at the age of only thirty-one, died. Her desire, according to the makers of the film, was to paint three really excellent paintings and have a child before she died: she succeeded in both. She wasn’t recognised for her work during her own lifetime, but has gone down in history as being the first female artist in Germany to have a museum dedicated exclusively to her works, and as the initiator of a complete artistic style. This is what many women had to suffer with, not just in Germany but throughout Europe and the rest of the world. Their job in life was to bring children into the world, raise them, and care for the men-folk, nothing more. Fortunately there were many who didn’t agree with this, otherwise our world today would be very much poorer when it comes to discoveries, inventions and art in all its forms. Unfortunately there are today, still, some who do not believe that a woman should be treated on an equal level as a man, whether she does the same job or creates art in her own way or not. And there are some who are prepared to allow hobbies, but will never take anything seriously. On Thursday I travelled in to Bremen to see a photographic exhibition on the works of Annelise Kretschmer, who had also been at Worpswede for a while, but was born a few years before Modersohn-Becker died, so they never had a chance to meet, but she was, apparently, influenced by the woman’s skills and her resolve. She, too, went against the desires of her family, who ran a very successful clothing store in Dortmund, and studied photography. In 1929 she opened her own studio on the second floor of her parents house – above the shop – and began her own success story. Here, I’m pleased to say, her success was almost guaranteed: she came at a time when women in the arts were being accepted as true artists, despite the number of men who still managed to take the cream of the pot for themselves, instead of just women following a hobby. Her career spanned about fifty years, and was only interrupted by the war in the Thirties where she could have had problems, being related to a Jewish family, was indulged by the National Socialist government as being useful. According to the catalogue to this exhibition, she is remembered as being one of the first women to open their own photographic studio, something which I disagree with: from my own photographic collection I can pull out ten or twelve different studios run by women under their own names. But it is still the same story: their names have been forgotten because they were women and not on the same artistic level as the men who, for better or worse, followed the same trade. The exhibition was most enjoyable; well laid out and quiet. I had a chance to see works by Kretschmer from the Twenties right through into the Seventies. Like Modersohn-Becker she had her own style, often taking photographs of walls, shadows, washerwomen at work, children, but as portraits without the studio effect. The example I have enclosed for you, from the late Forties, is a good example f her style: the child is not posed on a stool in a studio, but captured in a much freer sense, with the light falling across her young face and a real look of innocence, rather than a forced one. She took her earliest photographs in Dresden, where she attended photography school, and in Egypt before setting up her studio in Dortmund and making a name for herself in the fashion industry as well as with ordinary people. She took easy and relaxed portraits of some of the great names in museum and art history – those people who organise the exhibitions more than anything else, the curators and directors – which seem as if the artist has caught her subjects off-guard and in a moment when they were thinking of something g else, not forcing themselves into a pose for posterity. And, of course, children, the hardest subjects to photograph – along with animals, but for different reasons! The wonderful thing about photography, for me at least, is its unique nature. Up until more modern times, when a photograph was taken that was it. You had the image on film and it couldn’t be changed: the photographer had captured a fleeting moment in time which would never be repeated. A photograph is a piece of history. Today a person can use the latest technology to ensure their work is of prime quality; even amateurs can shoot off ten or twelve images and then pick out the best version, make a few changes with ready-made filters and publish the results immediately. The work that I collect is nothing like that at all, it doesn’t even have film as its original base. The negative is impressed upon a small sheet of glass and has to be developed very carefully indeed. My own cameras use film, which makes for a difficult life as I have to search out shops which still sell film! I went into a shop recently which had the grand title of World Of Photography, and they didn’t sell any film at all: no one wants it any more, they told me. But this is the World Of Photography, I said. No film. In another shop they had films, but when I asked for a larger format (one hundred and twenty: the size of the film) the assistant told me they only have films which allow thirty-six exposures on them. Nothing to do with the physical size of the film at all; but that was also a specialist shop for photographers, according to the sign on the door. The sad thing today is that the art of photography is so under-rated. Since everyone can now shoot images with their cell phones, and publish them for the entire world to see, an exhibition of photography is no longer considered an exceptional event. I love the fact that I can travel around the world without leaving the comfort of my couch, just by clicking on to Instagram or National Geographic, but it isn’t the same. I know many of these people have seen something, snapped a shot, and turned away to find the next exciting event. They haven’t had to consider light and showed, or move to a better position to compose the picture. There is no artistry involved. Take as snap shot, move on, add a filter later. Even focussing the camera – if you can call it that – is automatic. Perhaps I am too old – or getting to be too old – but sometimes I do think the old way of doing things was so much better; certainly it was more challenging. The results might not always have been as good as we would have wished, but it was a challenge. The one advantage of modern times which I will accept is that we can get to places quicker, in order to spend more time relaxing. As a youngster I would spend hours walking around the streets of London, York, Edinburgh and even Paris having taken a night train there. During Kretschmer’s early years, and certainly for all the artists before her, travelling took up a great deal of time; although, since there was no alternative, I am sure it made little difference to them. I read in the new book on the explorer Alexander von Humboldt the other day that he would travel months across the worst terrain just to see and climb a volcano, and thought nothing of taking a two thousand mile detour in Russia – on horseback and with carriages – to see a mountain range and cross the Mongolian / Chinese border. He was about sixty years old at the time, and the comfortable accommodation we have today, hotels and motels on every corner, just did not exist back then. His trip through Russia took six months – May to November 1829 – and covered ten thousand miles with six hundred and fifty-eight post stations, where they stopped to exchange fatigued horses ready for the next stage of their trip, and a total of twelve thousand two hundred and forty-four horses. Today we’d do the same trip by train – it would possibly take three or four days, but that’s nothing when travelling across Russia – or take the car and stop for gas every thousand miles or so, if there was a station, which cannot be guaranteed out in the wilds of Siberia! I’m quite happy travelling by train on the longer, inland trips, and taking the car the rest of the time. There was a time when I’d also pack a sleeping bag and stick my thumb out. That changed a few years ago to the sleeping bag and a larger car, where I could lower the back seats and sleep in reasonable comfort. Nowadays I do not have a sleeping bag: all the creature comforts of an hotel with breakfast included in the price. Which is what I am doing this week: off to a commemorative event in the town of Wiesbaden for two days. Good walking shoes, a warm pullover, my camera and notebook and, for the actual official side of things, a suit and tie. Next month I’m in Bavaria, right down in the south, and possibly also in Berlin for two other events. Perhaps all these new sights and experiences will give me something to share with you in a letter, who knows.